Each year I keep a list of every bird species I see in the Crail “parish”. My year list is a sort of competition with myself and helps me keep track of what I have seen and also what I haven’t. This year’s list has been slow and I haven’t been close to other years in accumulating species. But the last week has been great taking me up to 148, with the chance of beating my record of 157 in 2011 surely within my grasp. And today I managed to add another three more species, including a new one for my Crail life list. I met the county recorder, Malcolm Ware, yesterday at Balcomie and he told me he had heard a water rail calling form the pond at Boarhills. I have been waiting for a water rail to turn up by Crail for years – they are not uncommon, migrate a bit and although shy, they squeal loudly like pigs (really!) giving themselves away. But, as the name suggests, they like water, and freshwater too – reedbeds and dense stands of aquatic vegetation. This is, of course, in short supply around here so any water rail that does turn up will be like the jack snipe of last week, a migrant, lost and out of its normal habitat. Anyway, I finally lost patience with waiting to come across one by chance and went twitching. After all I have been waiting 12 years. I headed down to the pond at Boarhills this morning, walking through the stubble fields and putting up several common snipe from wetter corners. There is a good stand of reeds around the pond so it is perfect habitat for water rails. I put on some playback and within a minute I had two birds calling back and one bird running briefly around the speaker. A water rail for the Crail list at last. I should think they winter at the pond – they could even breed there – and I just haven’t been lucky enough to hear one calling the other times I have visited the pond, although this is probably only a dozen times ever. Playback of their calls is fairly irrestible to rails who keep in touch in their dense habitat (and they are also often nocturnal) by sound. 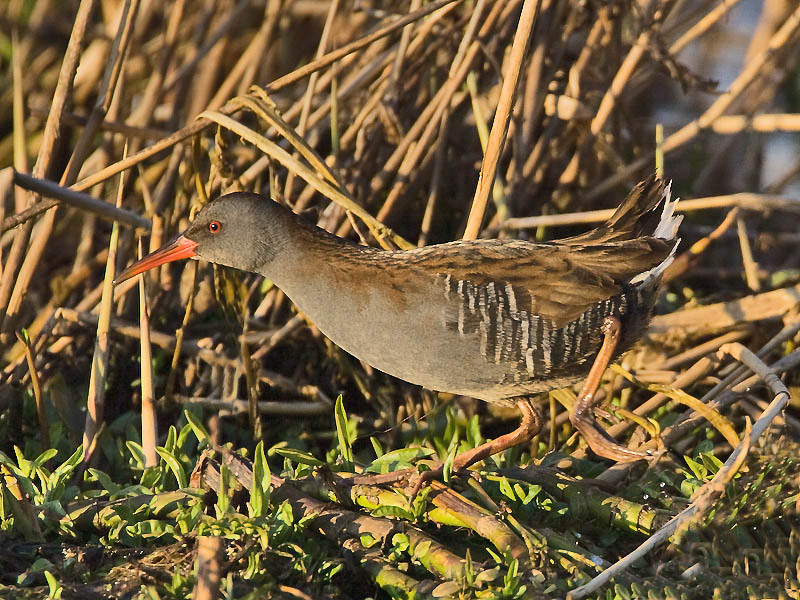 When you do see a water rail – and occasionally they come right out in the open – they are incredibly slim, like they have been run over, so they can slip between the reeds easily. They are also notorious for their varied diet including birds and mammals, and they have even been known to steal small birds out of the bottom of mist nets when ringers are catching birds in reed beds. The water rail takes my Crail list to 221 and the year list to 149. It would have been 222 but sadly the two former species of bean goose that both occurred in Crail during my record year of 2011 have been lumped back into a single species making me unsure as to whether the year list record is 157 or 156. Hopefully I’ll just get 158 this year and be done with it. This goal was helped by a greenshank (number 150) among the redshanks at the mouth of the Kenly Burn. Greenshanks are regular on the Eden and around St Andrews during the winter but are good birds at Crail or on passage through Balcomie, and this was my first since 2012. And then there was a huge commotion on the shore with all the oystercatchers and gulls flying up as if there was a large bird of prey about. I searched the sky but then found a brown horizontal blob with a swivelly head, perched on a distant rock being harried by a couple of crows. 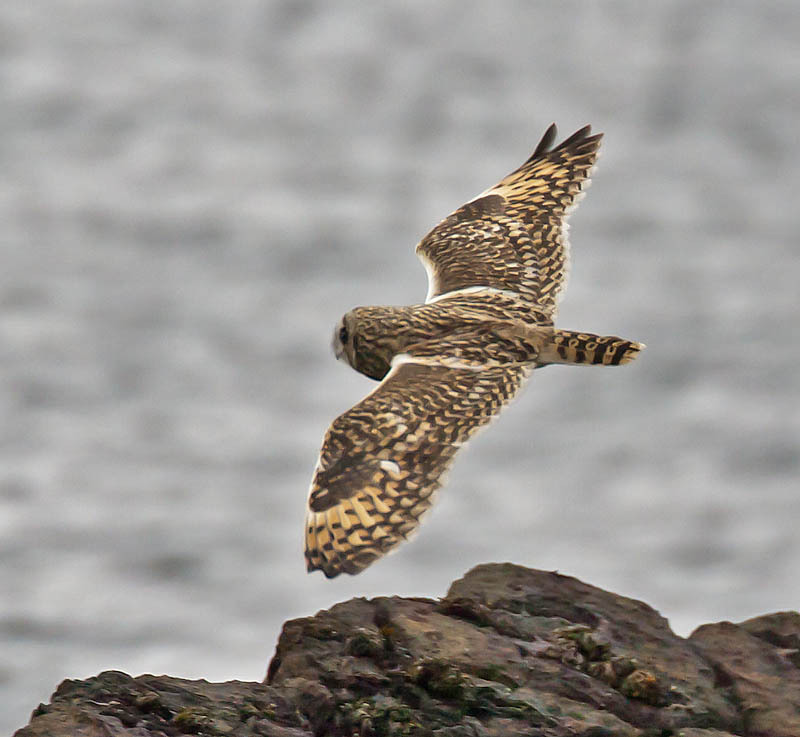 A short-eared owl (number 151). Again, my first since 2012. In some years there may be one wintering for a few weeks at Kingsbarns or Fife Ness, but even then I don’t see them often despite them being diurnal and so not hard to see. There were 6 canada geese also at the mouth of the Kenly Burn, somewhat less than the 200 there in September. I wonder if they will be here all winter now. I then walked back up the burn hoping for a dipper to really crack on with the year list. I didn’t see one, the first time in many visits that I haven’t got lucky. It’s the way of birding sometimes – 3 difficult species in the bag and the “easy” one not. I should be able to get dipper later before the New Year and it will be a good excuse to return to Kenly Burn which is as beautiful (especially today with the autumn colour) as it good for birding.